Arsenal boss Unai Emery was excited with his team’s display after they came from behind to defeat Premier League rivals Chelsea on penalties. The Gunners got off to a slow start in the game against Chelsea with teenage sensation Callum Hudson-Odoi providing all sorts of problems for full-back Hector Bellerin in the early stages of the tie. After Antonio Rudiger six-minute header had put Chelsea in the lead, fortune smiled down on Arsenal when Alvaro Morata missed a penalty just six minutes later. Emery’s team talk at half-time weaved the magic as the north Londoners improved their game in the second-half. They were rewarded for their effort late in the game when Alexandre Lacazette equalized in the third minute of injury time to force a penalty shoot-out. Chelsea’s midfielder Ruben Loftus-Cheek missed the decisive kick that enabled Arsenal to emerge as victors after they had netted all six of their penalties. 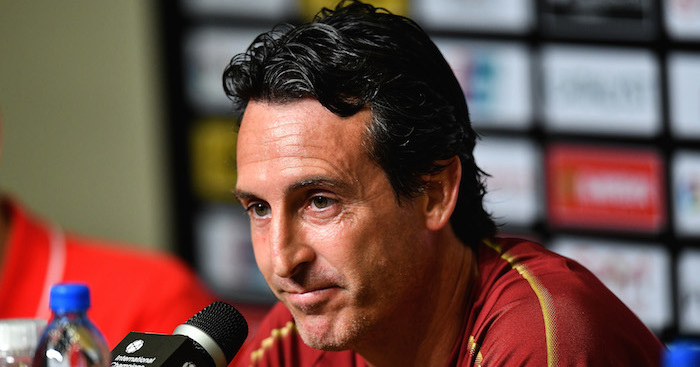 While it was only a friendly, the win enabled Arsenal to put down a small marker for the season ahead, and Emery was pleased with the reaction of his players after their early setback. “We are pleased with the 90 minutes because I think the performance was getting better throughout the match after the first goal. But I think it’s also good because in this moment we need to stay together and react to these moments in the game, and then I think we controlled the match with possession, had proper positioning on the pitch and created lots of chances which led to the goal. “For that, I think the performance tonight was good, and it will help us in our preparation for the start of the competition,” he told the club website. The London side faces an anxious wait for further medical updates on Aaron Ramsey and Sead Kolasinac. After his struggles last season, Lacazette appears to have got off to a strong start in pre-season and scored the equalizer for Arsenal in Dublin. “I am delighted with their positioning off the ball and breaking the opposition’s lines. Then for the finishing, we want to continue improving that, but we have very, very good strikers in Lacazette, Aubameyang, and Nketiah. For me, the best situation tonight is that our striker took his chance tonight and grabbed the goal,” added Emery. Arsenal’s next tie is a game against Lazio in Stockholm before squaring up against Premier League defending Champions City in the season opener on August 12. Previous What is the Price of Messi Soccer Cleats?